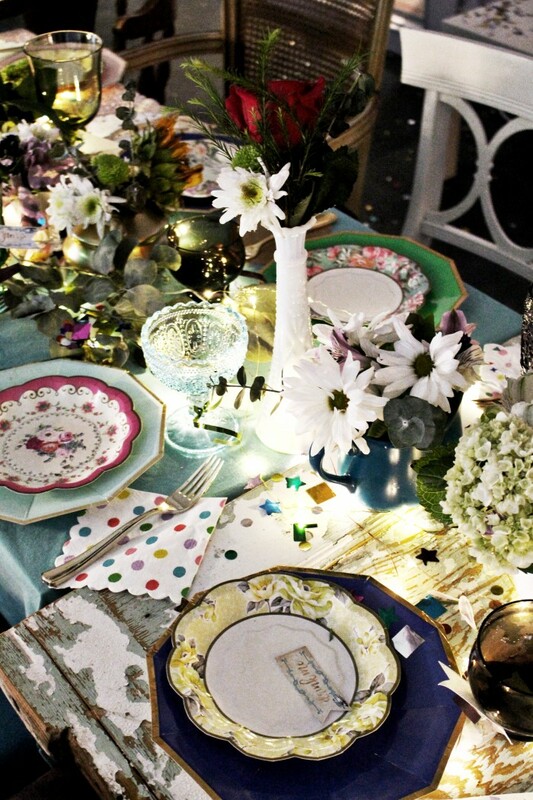 This Alice in Wonderland Mad Hatter’s Tea Party mixes colorful whimsy with vintage elegance for a perfect-for-all-ages dinner party. 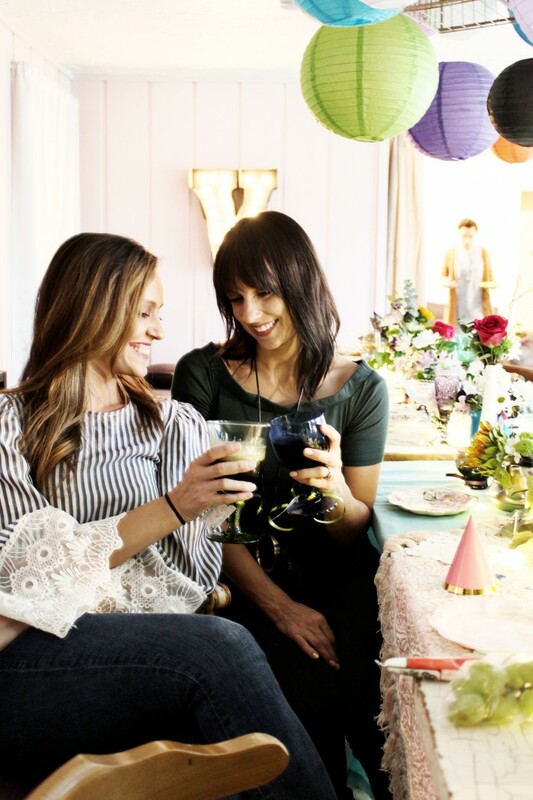 I am thrilled to finally be sharing this fun party we put together for our brother’s 40th birthday! 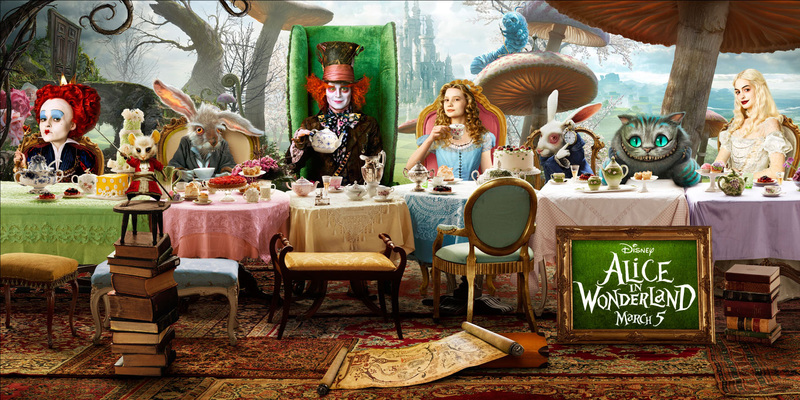 As an avid Alice in Wonderland fan, my brother requested a Mad Hatter’s Tea Party theme for the event. 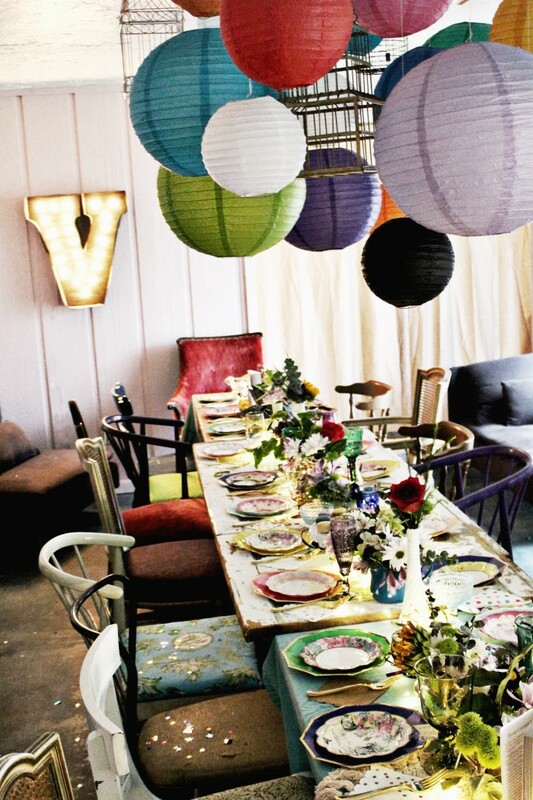 I am always excited to put together a party but with a theme like this I knew I’d have a great time thinking of ways to make it unique. 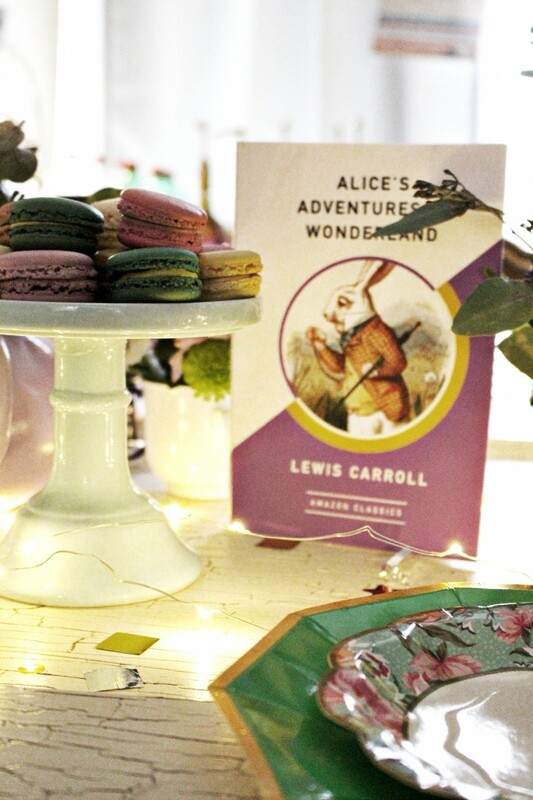 It’s not exactly the most original idea, so I saw it as somewhat of a personal challenge to make it different from all the other Alice in Wonderland parties I’d seen. While I’m pretty sure my brother enjoys all the versions of Alice in Wonderland, he particularly loves the Tim Burton version. With it’s dark whimsy, I tried to seek inspiration directly from the film and was struck by how well this poster for it matched the vision already in my head. 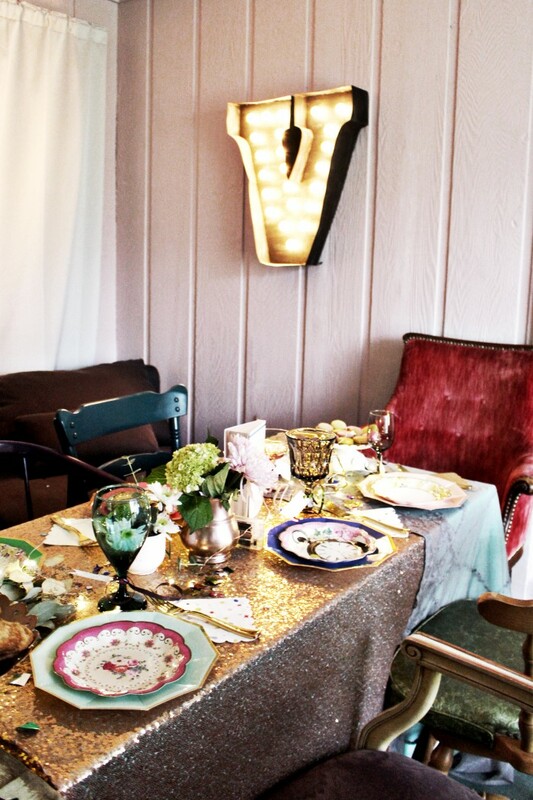 My dad and I had made these tables from vintage doors this summer to use for a bridal shower I hosted. (I’ll be sharing that party soon!) And I immediately thought of them for this party. The scene when Alice first visits Wonderland and is trying to fit through the door came to mind and I thought they’d be perfect. But I also knew I didn’t just want a moody, vintage look. I wanted to incorporate lots of color and fun elements since the silly side of the story is what my brother loves most. 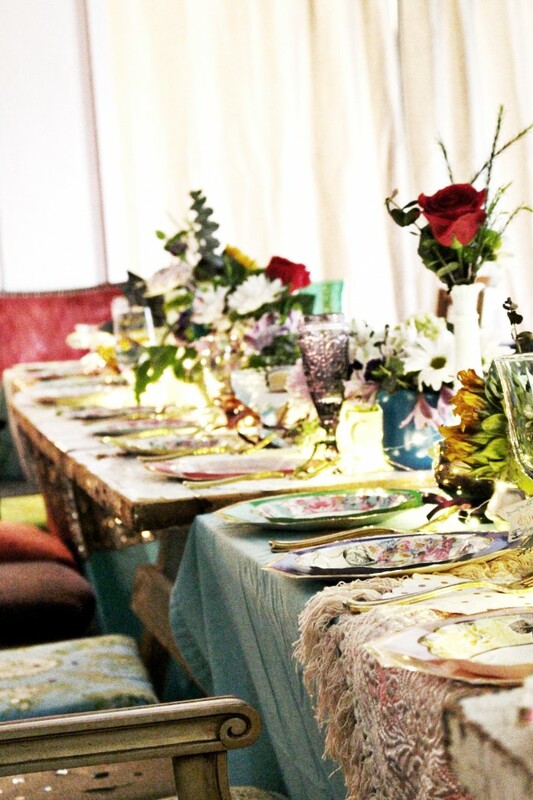 I wasn’t sure my initial idea would pan out well, but once I put the colorful kazoos and fun mixed confetti I had bought next to some vintage cups and tablecloths, I knew the idea was gold. I just loved the mix of playful and delicate. To all of our joy, Malissa was able to be in town for the weekend! She was absolutely vital in the planning and execution of this party and I was thrilled she could be here to enjoy it. And also that her husband Greg could come take the photos :D He does such a great job! Now, the original plan for this party was to have it outside. I knew the decor would be complimented beautifully by the pine trees and fallen leaves in my backyard. However, planning an outdoor party for the end of September in Utah is a risky business for sure. The weeks leading up to it were beautiful. But of course the day of was not. Luckily, my home has a large living space that we were able to clear out for the event. And honestly, I’m so glad it ended up this way. 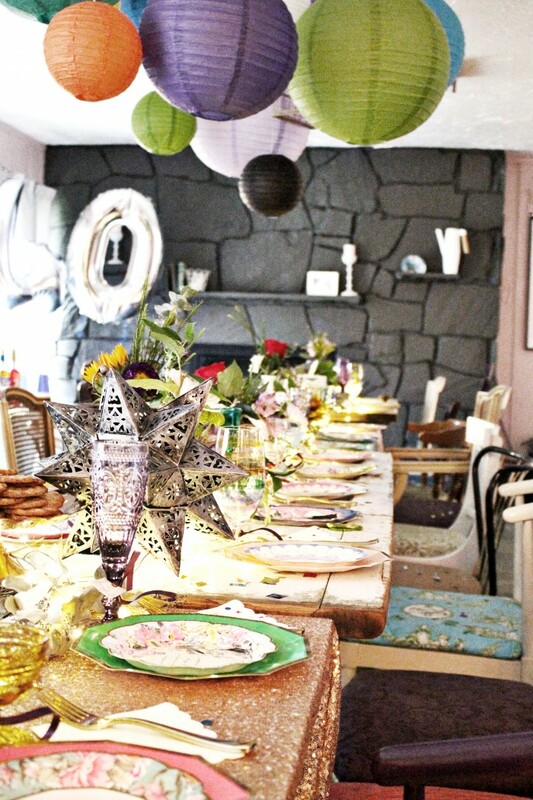 The decor looked great indoors and even warmer and more welcoming. Plus, set up and take down was easier haha! We decided to use a mix of tables, rather than just the door ones I previously mentioned. Every other table was just a regular one, covered in a tablecloth. 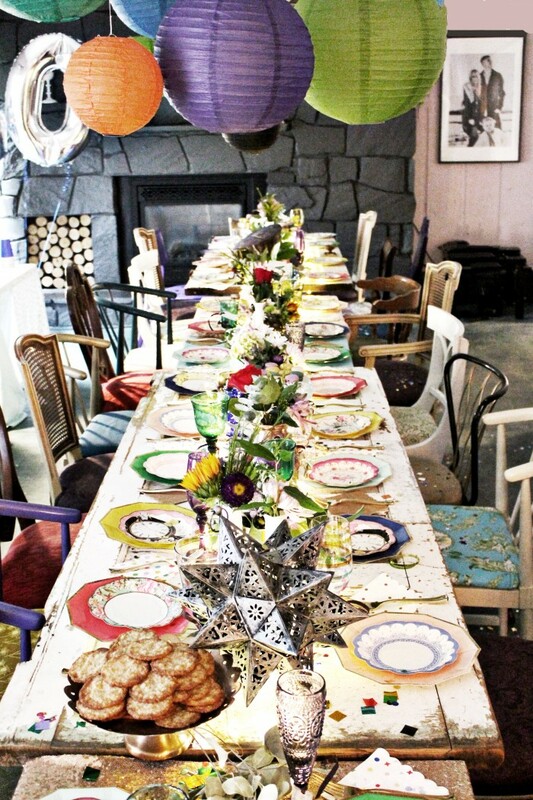 I have a great collection of tablecloths and I rarely use them. But since they were instrumental in helping my vision come to life, I wanted their texture there. Plus, the poster I previously mentioned showed mixed tablecloths so it stayed true to our theme! This really helped the different sizes of tables match as well. 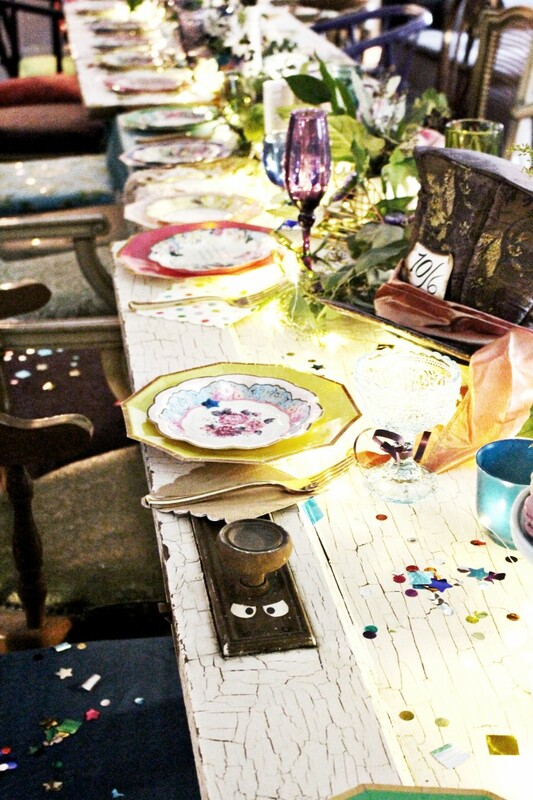 We had vintage cloths, sequin cloths, crochet cloths, and it was magical putting them all together like this with the destroyed wood/worn paint of the doors. Swoon! 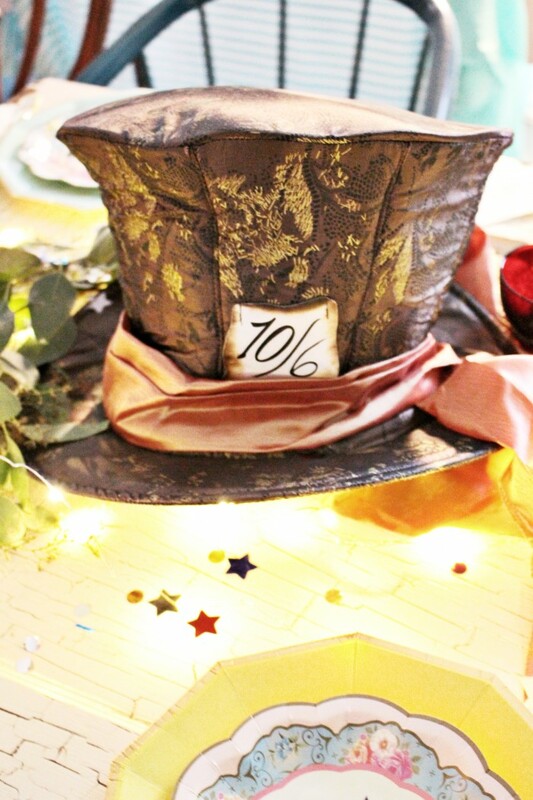 The centerpiece was a great eclectic mix of vintage teapots that I had spray painted turquoise, purple, lavender, gold, and cream as well as vintage vases, mixed cake stands with French macarons, flowers, greenery, fairy lights, Alice in Wonderland books, and this awesome Tim Burton style Mad Hatter’s hat. Basically the center of the tables was everything all together. haha! All of it was just beautiful together. Absolutely essential, though, were the fairy string lights! We got a mix of the copper, gold, and silver strands from Ankit and they literally made the party. 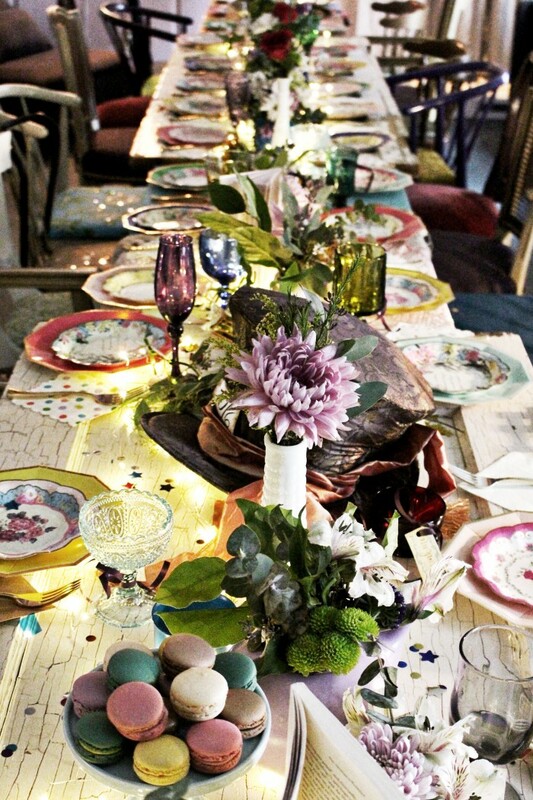 They lined the whole tablescape and made the whole thing pop. Honestly, without them, I’m not even sure this party would be worth sharing! haha. 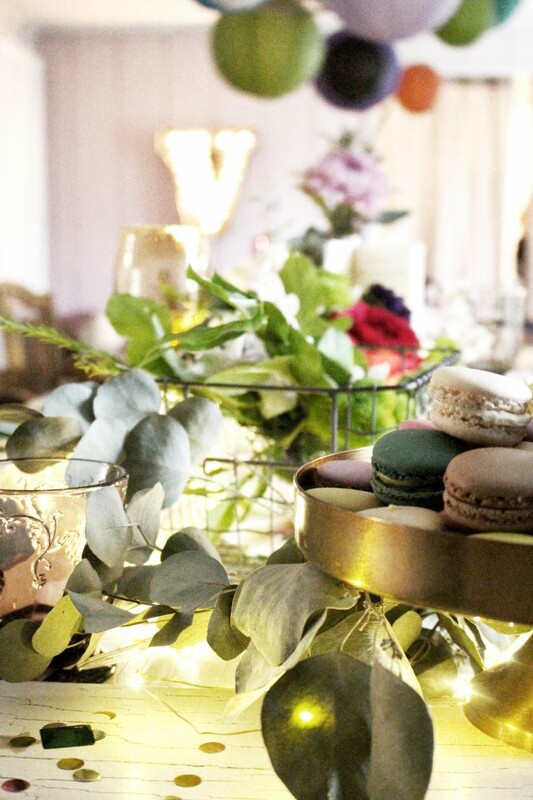 Especially on the dark rainy day of the party, they were warm and inviting and perfect. Such a huge fan of these cute little lights! I always worry about mixing real dishes and paper ones. I knew I wanted to use my vintage glasses, but I don’t have a collection of vintage dishes to go with them. And, even if I did, there is no way I’d have the amount we needed for this party. 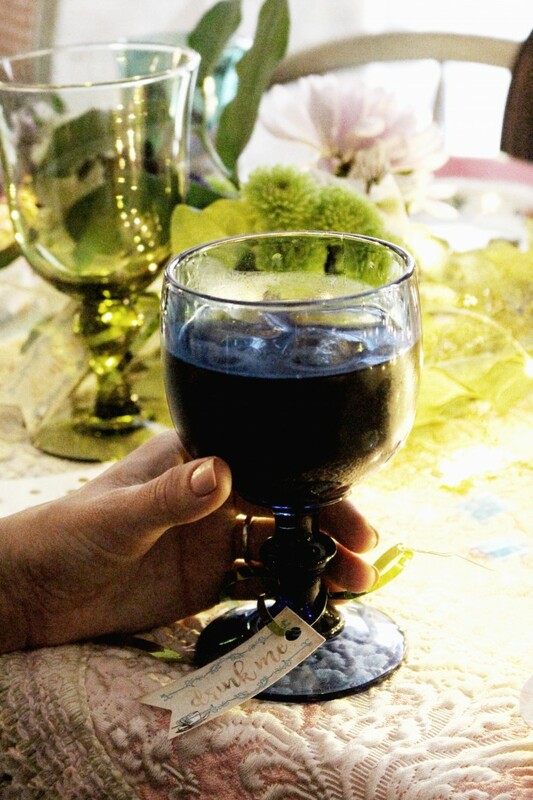 I really loved the Truly Alice collection from Talking Tables and I thought the plates were elegant looking enough to mix with my stemware. Boy, I was not disappointed! I really feel like all the paper and plastic elements (we used a mix of gold, silver, and copper utensils-from Zurchers) combined perfectly with the real glasses. 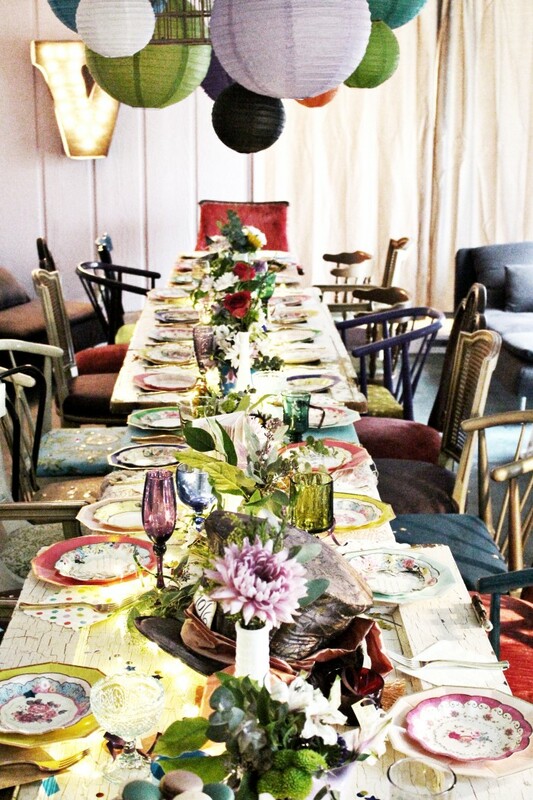 I layered the Alice plates on top of these Meri Meri Happy Birthday ones to bring in the fun, colorful side of the party. Some of the other things we did that are not pictured was an Italian soda bar which everyone LOVED! It was tons of fun for all ages. We just got 5 different flavors of the DaVinci syrups from World Market and had a few different sodas out and whipped cream. So yummy and fun! We also did a Decorate Your Own Teacup station with these little paper teacups and a variety of stamps, markers, stickers, and stencils! We also did a photo booth! Lots of props were put out and we set out an Instax camera so people could have a fun little favor. 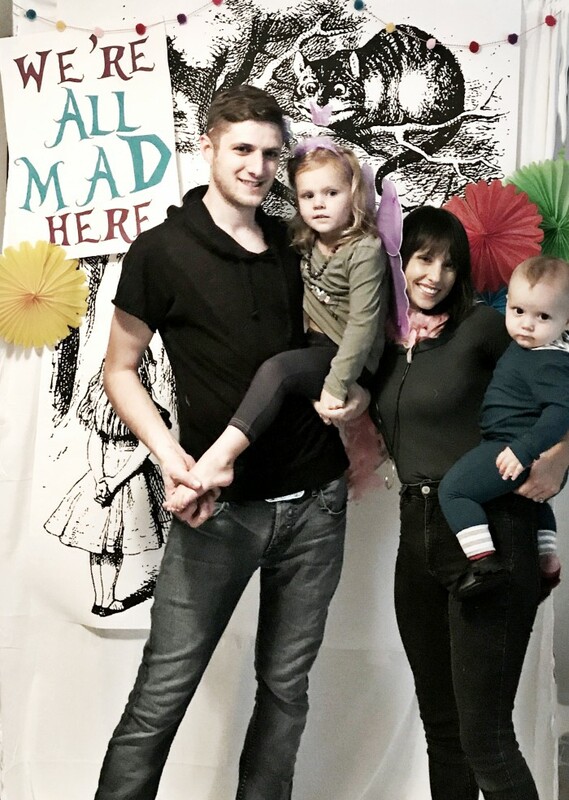 The backdrop was put together with two large engineering prints using an image that I scanned in from an illustrated copy of Alice in Wonderland. I was thrilled to get a picture with my whole family together haha. It is so hard to take family photos! It was so fun to throw this party. Even though I was originally not as excited for the theme because it wasn’t super unique, it ended up being one of my very favorites! And I was so grateful my brother trusted us to do it and that his wife let us take it over. What is your favorite part? 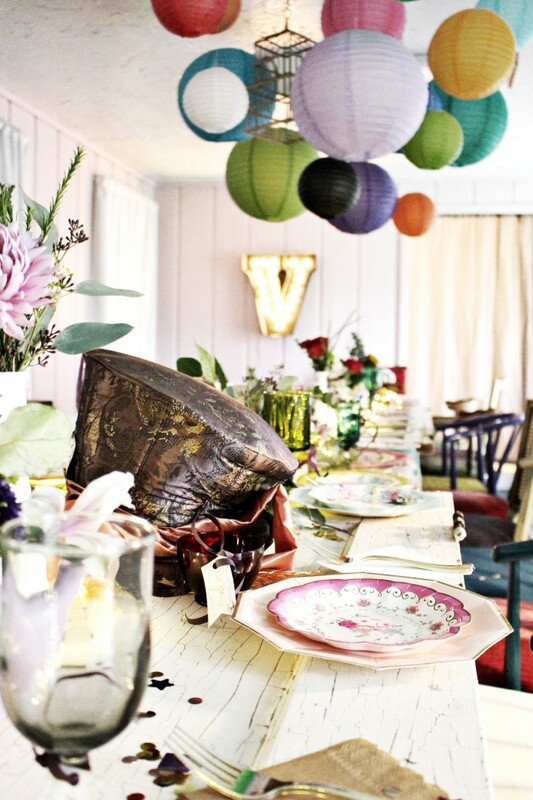 Would you mix this much vintage with modern colorful items?! Let me know in the comments!